Cost per Thousand Impression (CPM) advertisements are easy and good way to make money blogging. CPM advertisement pays according to the impression of advertisements. Impression means how many times an ad appear of your blog. CPM ads at prominent position ensure better income. So let`s talk about the popular CPM advertising programs. CPM ads pay good to those blogs which have good number of traffic. As usually CPM networks pays $1 to $3 per thousand impressions. Technorati allow you to choose from different ad images format. Minimum payout limit is $20. They also give you payment options such as check, Wired transfer, account credit or Paypal. Technorati is one of the best CPM ad network and good alternative to Tribal fusion. CPX interactive is also an ad network which provides different ad types and sizes like banner leader board (728×90) , (468×60), Skyscraper, Pop-ups etc. You can choose according to your need. Minimum payout limit is $50 and 60% is payout percentage. Value Click Media is also a good CPM network. Your blog should have 3,000 impressions per month to get approved. They have different ad sizes and types of advertisements. Minimum payout limit is $25 and payment options are cheque and PayPal. Your blog should have 500,000 unique users per month to get approved. Minimum payout is $50. Payment option is check through mail. They are the best CPM network but getting approval is toughest. If you blog have 25,000 monthly page views or 5,000 monthly unique views then it will get approved. It also offer various ad formats like skyscraper, scroll banners, pop-ups, leader boards. Minimum payout is $50 which you can receive through check or paypal. These were few of the best CPM advertising networks, which I recommend . 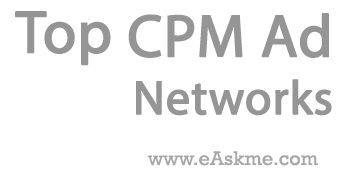 Do share Which CPM advertising network you are using? If you like this article, do share on Facebook, twitter and Google Plus. Don`t forget to like us on facebook or subscribe eAskme newsletter to get free updates.